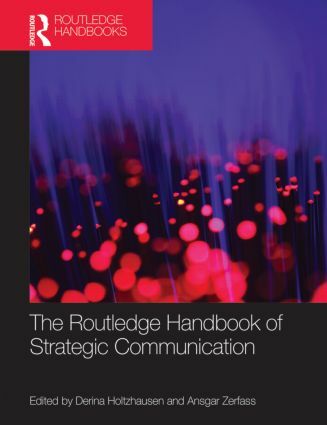 The Routledge Handbook of Strategic Communication provides a comprehensive review of research in the strategic communication domain and offers educators and graduate-level students a compilation of approaches to and studies of varying aspects of the field. The volume provides insights into ongoing discussions that build an emerging body of knowledge. An international set of authors contributes to this volume, illustrating the broad arena in which this work is taking place. A timely volume surveying the current state of scholarship, this Handbook is essential reading for scholars in strategic communication at all levels of experience. Chapter 1. Strategic communication: Theoretical foundations and progress of the research area. Ansgar Zerfass, University of Leipzig, Germany. Chapter 2. (Re-)reading Clausewitz: The strategy discourse and its implications for strategic communication. Chapter 3. The strategic turn in communication science. Simon Torp, University of Southern Denmark, Denmark. Chapter 4. Strategic communication and the public sphere. Günter Bentele and Howard Nothhaft, University of Leipzig, Germany. Charles Self, University of Oklahoma, USA. Chapter 6. Communication in a Networked World. Chapter 7.Contextual Distortion and strategic communication. Chapter 10. Cultural influences on strategic communication. Chapter 12. Strategy as communicative practice in organizations. Sergio Bulgacov, Escola de Administração de Empresas de São Paulo, Brazil. Gail Thomas, Naval Postgraduate School, USA. Emanuele Invernizzi and Stefania Romenti, IULM University of Milano, Italy. Chapter 15. The role of communication executives in strategy and strategizing. Finn Frandsen and Winni Johansen, Aarhus University, Denmark. Chapter 24. Strategy in advertising. Guido Zurstiege and Tino Meitz, University of Tuebingen, Germany. Chapter 25. The strategic context of political communication. Chapter 26. Communicating Strategically in Government. Chapter 28. Strategic Activism for democratization and Social Change. Chapter 29. Strategic dimensions of public diplomacy. Chapter 33. Crisis communication and improvisation in a digital age. Mats Eriksson, Örebro University, Sweden. Chapter 34. Strategizing risk communication. Chapter 35. Strategic communication during change. Rita Järventie-Thesleff, Johanna Moisander and Mikko Villi, Aalto University School of Economics, Finland. Derina Holtzhausen is professor and director of the School of Media and Strategic Communications at Oklahoma State University. Ansgar Zerfass is professor of strategic communication at the University of Leipzig, Germany, and professor in communication and leadership at BI Norwegian Business School, Oslo, Norway.